We’d love your help. Let us know what’s wrong with this preview of The Wheel of time series by Robert Jordan by Robert Jordan. To ask other readers questions about The Wheel of time series by Robert Jordan, please sign up. how many books in total and in what order?? Book 1 seemed a very (surprisingly) precise copy of The Fellowship of the Ring, except all the epicness of the said Fellowship of the Ring somehow absented itself from Jordan's writing. I've been looking to get into a nice long fantasy series and I was thinking to myself: I should try this again. Dear Goodreads and fans of Robert Jordan-- if I couldn't stand book one the first time around, do things change by book 14? This series is the reason that I haven't added anything to Goodreads in a while. I've been reading the 13 books of The Wheel of Time. And I'll say right off that it is fantastic. Rather than reviewing each book individually, I decided to just review the entire series together, since it is an integral story and it just wouldn't do to read any of the books on their own. I often find myself trying to explain to my friends why I don't like the Harry Potter series, or other similar young adult fantasy This series is the reason that I haven't added anything to Goodreads in a while. I've been reading the 13 books of The Wheel of Time. And I'll say right off that it is fantastic. Rather than reviewing each book individually, I decided to just review the entire series together, since it is an integral story and it just wouldn't do to read any of the books on their own. I often find myself trying to explain to my friends why I don't like the Harry Potter series, or other similar young adult fantasy/scifi books. I struggled to explain the lackluster writing, inconsistent and implausible characters, and unsatisfying/frustrating plot elements. From now on, whenever I'm in a similar discussion, I'll simply point them to this series and say, "Read this, and you'll understand." There is still one more book to be written (#14, A Memory of Light), that should be released early next year. The last three books (#12, #13, and #14) are written by Brandon Sanderson, since the passing of Robert Jordan in 2007. As I got closer to these final books, I was worried that the series might suffer, being completed by a different author. It might be simply the fact that major threads of the story are nearing their conclusion, but I've actually enjoyed the Sanderson authored books even more than the Jordan books. This is the first fantasy series I have read that can be put on the same shelf with my Tolkien collection. I have often heard Jordan compared with Tolkien, and after reading his series, I agree that he deserves the comparison. The story of The Wheel of Time can be described as epic, intricate, detailed, elaborate, engaging, and satisfying. I originally listened to the audiobooks during my commute (with wonderful voice acting by Michael Kramer and Kate Reading). Since finishing the audio of book #13, and while waiting for #14, I've started re-reading the physical books. I've noticed plot elements that are teased in book #1, that only finally come full circle in #13. It's amazing that Jordan was able to plan his story with such detail, that far in advance. With such a long series, I worried that the books would fall to the same failures of most modern TV dramas. That is, the writer introduces mysteries that he can't write a satisfying conclusion to, so he simply adds more mysteries. The story quickly becomes a quagmire of confusing and inconsistent plot arcs. I never felt like this happens in Wheel of Time. The story always seems to be moving forward with a confidant air of direction and purpose. I only hope that the final book to come can resolve the story with the same satisfaction. I'll close by saying simply, The Wheel of Time is a pure joy to read. **Update**[Feb 4th, 2013] - I recently finished the 14th and final installment in this saga. The last book is a hefty 393,000+ words, and yet I felt as though Brandon Sanderson really struggled to include everything that needed to be covered. I actually could have gone for splitting this book into two parts (even after the original finale, #12 was split into three parts to give us #13 and #14). It left me not quite satisfied about how some of the smaller plot lines were closed. In order to resolve these, a lot of the related action had to happen off screen. That being said, I really like the way the story ended. I felt that the finale was just as epic as any 14-book series deserves. While I would love to have kept reading past that final sentence, I felt satisfied with were the story left the narrative and the characters. Tolkien WHO? Robert Jordan is the king of fantasy. This series is the best set of fantasy novels ever written, in my humble opinion. I am going to keep this short, because I could write a three hundred page review of this, and STILL not be able to sum up how monumental this series of novels is. (And mind you, I am NOT a real fan of epic fantasy novels.) This set of books positively amazed me. The, without a doubt, best long going fantasy series ever. Follow Rand, Mat and Perrin as they're led by Moiraine through a world of wonders as the Dragon reborn arrives to the world, reincarnated, after being dead for 3000 years. Many, many other characters will be introduced, loved, hated, understood, wondered about and everything you can think of. People call Tolkien the best fantasy author of all times, either they haven't read The Wheel of Time, or, they don't have the cognitive capability to The, without a doubt, best long going fantasy series ever. People call Tolkien the best fantasy author of all times, either they haven't read The Wheel of Time, or, they don't have the cognitive capability to understad true wonder! The first 2, maybe 3 books where enjoyable but Jordan's limitations as a writer rapidly become clear. He obviously stalls the plot, struggles writing dialogue and characterizing females. Often, we are told the results of a conversation rather than given the conversation itself. Women are all portrayed in a same-y fashion, and Jordan's over-reliance on the description of environmental minutiae drags the stories down. If a paragraph began describing either a rope-worked silver tray or the design o The first 2, maybe 3 books where enjoyable but Jordan's limitations as a writer rapidly become clear. He obviously stalls the plot, struggles writing dialogue and characterizing females. Often, we are told the results of a conversation rather than given the conversation itself. Women are all portrayed in a same-y fashion, and Jordan's over-reliance on the description of environmental minutiae drags the stories down. If a paragraph began describing either a rope-worked silver tray or the design of a woman's skirt, I found myself skimming it for any real content and skipping it completely if there was none. That being said, I finished the entire series (through #14) on the hope that it would redeem itself. The final book is a massive disappointment. The cavalier way in which some of the best plot threads are resolved (Fain in particular), and the bizarre showdown that the series culminates in leaves me regretting the time invested into this series. I've been reading this series for about 20 years! I actually started to cry when I heard that the author had died! I love the characters and detail in the series, and I think Brandon Sanderson has done a great job continuing in Robert Jordan's style. The last book is suppose to be released In January of 2013 - I can't believe it will actually be complete! When this series began, I was in eighth grade. By the time it finished, I was four years out of college. Twenty-three years and fourteen books. To be perfectly honest, I stopped reading the damn thing in high school. By the time book four came out, I realized that I couldn't remember who was where doing what without going back and reading the previous books. That meant over two thousand pages of re-reading before tackling the next nearly thousand pages. None of the characters or events had engaged enough of my interest by that point to warrant my continuing, so I stopped. But now I'm older, and more able to handle dense, convoluted prose. (Thank you, nineteenth-century novels!) And since I'm avoiding getting sucked into the current massive multi-decade fantasy epic that seems like it'll never end, I thought I'd read the previous one. Jordan is a solid writer, even if his prose could use a severe pruning. He creates vivid scenes and fairly well individuated characters. I don't think his magic system is unique since it uses fairly traditional characteristics, i.e., four elements plus a spirit element and binaristic* genders, but he's consistent and creative with its use. And I have to say, even though it might take him thousands and thousands of pages, I never really get the feeling Jordan doesn't know where he's going. He just tends to end up dwelling on minutiae for so long you start to wonder if we'll ever get there. I don't remember how much I noticed the gender politics the first time I tried reading these books, but I do remember that I didn't like the way the men talked about the women. Reading them now, I was floored. It seems like at least once a chapter, someone says something like, "Women were so alien it seemed almost impossible they had been made by the Creator." Women are forever getting spanked or stripped naked (or both!) as punishments, and one man is told that he's got to take charge with his wife so she won't think he sees her as weak. It's just relentless, and it interfered with my ability to get absorbed in the books. I kept getting the feeling Jordan wasn't expecting women to read them. There are also some awkward cultural appropriations. The ancient symbol of the magic users is quite obviously a yin yang symbol. The people called the Aiel are apparently a mishmash of "the Zulu, Bedouin, Apache and Japanese cultures, among others." Oh, and Irish culture, because Jordan thought it would be fun to have desert dwellers with the Irish clan structure. It makes me faintly uncomfortable to have all of these disparate cultures thrown into a blender set on puree. The "Wheel Of Time" series starts very well, and has enough unique worldbuilding, interesting plot, and strong characters to make it a great read. The first few books are well told, although at the end of the second book, I was afraid that there was going to be too much common structure to the ends of all the books in the series. That turned out not to be the case. The series started wandering in book 4 or so, and eventually fell into some sort of plot swamp from which it didn't emerge until abou The "Wheel Of Time" series starts very well, and has enough unique worldbuilding, interesting plot, and strong characters to make it a great read. The first few books are well told, although at the end of the second book, I was afraid that there was going to be too much common structure to the ends of all the books in the series. That turned out not to be the case. Eventually, working from Jordan's notes, Brandon Sanderson (of Mistborn fame, and more) wrote books 12-14 to finish the series. I found these last books to be a more enjoyable read than the earlier books, perhaps because I did have the sense that we were heading towards a conclusion of some sort. Reading these books, I was glad that I had persisted and overall it was a wonderful series. I had been wondering how it could be that both the war and the more personal combat could matter, and to my pleasure this was handled very well. I thought the story strands were tied together better than I could have hoped given the complex weave. I started reading the Wheel of Time series in 2001 when I had just turned 14. Being a rather tall and skinny boy who fancied himself as having a big destiny I found my hero in Rand al'Thor. Over the next 12 years I read, and re-read, the available books every year or so. Without a doubt this series gave me the most vivid image of any book I have read as Jordan lovingly creates his characters and their entire world. I believed that this world of magic, intrigue and mystery really did exist and I loved following Rand, Perrin and Mat as they grew into men. For the rest of my life I will remember the joy I had when each remaining book was released and once again diving into the WOT universe. Without spoiling the books there really are some amazing chapters that will stay with you forever. With this glowing praise you would have expected 5 stars for the series. The reason why I do not think it is worthy of that is because some of the exposition is, quite simply, unnecessary. Chapters devoted to the countryside and clothes worn by the characters become tiring and the same phrases used over and over becomes grating. Coupled with some of the infuriating dialogue and relationships shared by the characters it does knock some of the enjoyment. I just finished the 13th book in this series and there is one final book to be released in January 2013 called "A Memory of Light". This series is the classic fantasy tale of the struggle between light and dark, good and evil, death and life. Originally, I was reading a Brandon Sanderson trilogy called "The Mistborn Trilogy" which I enjoyed. In researching what else he had written I found that he had finished the last books in the "Wheel of Time" series due to the death of it's author Robert Jor I just finished the 13th book in this series and there is one final book to be released in January 2013 called "A Memory of Light". This series is the classic fantasy tale of the struggle between light and dark, good and evil, death and life. Originally, I was reading a Brandon Sanderson trilogy called "The Mistborn Trilogy" which I enjoyed. 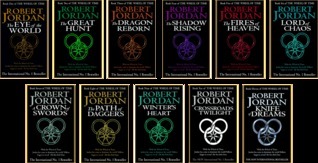 In researching what else he had written I found that he had finished the last books in the "Wheel of Time" series due to the death of it's author Robert Jordan in 2007. That was the beginning of my journey through these books. Epic! Has it's dry/slow parts but stick with it! My entire life has been spent reading these books and it has not been a waste of time. It was torture to wait and depressing Jordan didn't get to finish the series but Sanderson did a great job. I have read books 1 - 13 and enjoyed them each to varying degrees. But I have enjoyed them all. My favourite is the first The Eye of the World, which introduces the main set of characters who inhabit the series, and establishes the world they live in. It is in this book where you see how their unworldly innocence and childhood loyalties and ties change when thrust out into the world. These characters are the shy and serious Rand, the mischevious Mat, Perrin the gentle thinker and Egwene the fier I have read books 1 - 13 and enjoyed them each to varying degrees. But I have enjoyed them all. My favourite is the first The Eye of the World, which introduces the main set of characters who inhabit the series, and establishes the world they live in. It is in this book where you see how their unworldly innocence and childhood loyalties and ties change when thrust out into the world. These characters are the shy and serious Rand, the mischevious Mat, Perrin the gentle thinker and Egwene the fiery young woman determined to see the world. These four are taken from their village by the grand lady Moiraine and her bodyguard, Lan, when monsters attack their village looking for the three boys. Moiraine is really an Aes Sedai - she belongs to an order of woman who wield not just external flows of 'power' but also political power; because of their plans within plans, they are not generally well liked but are deeply respected. The four find they are more than just village youths themselves - the boys are each ta'veren; they change events around them and by the same token, are pulled along by fate to accomplish what must be done regardless of their own feelings. They each grow into heroic characters fortold by prophecy to take on evil. In the first few books, I liked the characters, plot development and imagination of the author. I speedily read through the first seven books or so, but soon became disappointed that nothing seemed to be "happening," or at least that there was no end in sight. I read another several books, and got to the point where I would guffaw in frustration every time YET ANOTHER cast of characters were introduced (I had begun to draw charts just to keep track of who was who at this point). I skimmed a few In the first few books, I liked the characters, plot development and imagination of the author. I speedily read through the first seven books or so, but soon became disappointed that nothing seemed to be "happening," or at least that there was no end in sight. I read another several books, and got to the point where I would guffaw in frustration every time YET ANOTHER cast of characters were introduced (I had begun to draw charts just to keep track of who was who at this point). I skimmed a few more books, skipping the parts that dealt with the burgeoning collection of new characters, concentrating on what was happening to the central cast, before just burning out on the whole thing. Rand was becoming such a jerk that I didn't much care what happened to him anyway. "Let this whole imaginary world go to hell, for all I care," is where I ended up, no longer interested in this unending fantasy soap opera. Perhaps Sanderson (I love the Mistborn trilogy, and must check out some of his more recent stuff), a much better writer than Jordan, did the series justice in the last few books. I simply don't care enough to find out. However, the world is quite rich and the characters are entertaining. Books 8-11 were a little less interesting as things progressed very, very slowly but I've been following this series for more than 20 years and stubbornly continued to buy the books as I wanted to see how it ends. Sadly, somebody nailed Robert Jordan's coffin shut much too soon but I have read and enjoyed the subsequent books in the series written by Brian Sanderson based on Robert Jordan's instructions. I haven't read the very last one in this epic series yet but I'm certain, I won't be disappointed when it hits the stores in January 2013. This series is still one of the best fantasy series out there and it's a good introduction to the genre in general - especially if you begin reading it as a teenager or a young adult. After Tokein very few have successfully managed to carve out original universes of their own. Jordan's 'Wheel of time' series is huge, in every manner. From the concept to the volume to the character plots. He's managed to create a frame where every law of the universe has been crafted by him. The wheel of time, the different ages, the prophesies, physics itself. The contempt he makes you feel for the Red and Black Ajah, to the uneasiness at the creation of the Ashahman, Jordan can manipulate your emotions through his writing just as he intends (not that I'm complaining). This series is MASSIVE. A true masterpiece to uphold and a staple for any fantasy lovers - if you can keep track of hundreds of characters and places. It is one of the better written fantasy series available, and it would not surprise me to see this series eventually made into movies. The only shame is the death of Robert Jordan before he could finish it, but he got a suitable replacement author to do the job. The final book actually was the worst in my view because of this. It felt like it just This series is MASSIVE. A true masterpiece to uphold and a staple for any fantasy lovers - if you can keep track of hundreds of characters and places. The final book actually was the worst in my view because of this. It felt like it just stopped cold-turkey and left a lot of unanswered questions. Overall a fantastic series, Mat Cauthon in particular was a favourite character (though I will say he was poorly written by Brandon Sanderson). Some books were a little long winded and only contained a few relevant events to move the series along (the 6th or 7th comes to mind) but apart from that my all time favourite series. Have read multiple times!! I loved every book in this series except the ones that also include the writing of Brandon Sanderson. I will read a few of his works and give them another try. Let me start by stating that I love fantasy fiction. I've waded my way through a truckload of fantasy series in my time - some spellbinding, some crazily plot-driven and gripping, some determinedly mediocre, and some barely worth the paper their words are printed on. I have rarely left a book or series of any sort unfinished, if only to know how the story turned out, regardless of how crappy the writing was. So for me to not finish this series that's beloved of so many people is quite significan Let me start by stating that I love fantasy fiction. I've waded my way through a truckload of fantasy series in my time - some spellbinding, some crazily plot-driven and gripping, some determinedly mediocre, and some barely worth the paper their words are printed on. I have rarely left a book or series of any sort unfinished, if only to know how the story turned out, regardless of how crappy the writing was. So for me to not finish this series that's beloved of so many people is quite significant. Yet, nothing has made me as enraged as having invested the time I have in this series. Books 1-3 introduced readers to fresh and creative world-building elements, and while I wouldn't say that the writing was tight, the prose was serviceable enough to support and explore these ideas. There was enough in these books that made me continue reading (helped by the fact that the first two books had already been published when I first started on the series). Now, I know it's not the author's fault that ill health overtook him and slowed down the production of these books to a crawl, but the quality truly took a nosedive during this time. The stories were mired in endless descriptions that didn't do much to develop the characters, the world, or the story, and the characters themselves spent countless pages indulging in one-dimensional self-imposed emotional isolation. People have criticised the poorly drawn female characters, but I didn't find the male characters any better. One has to wonder what his editor was doing. Or not doing, in this case. The most damning indictment for me was that the intertwining stories had become so forgettable that I pretty much had to re-read all the previous books every time a new one came out, just recall the developments, only to find that it wasn't really necessary because the stories hadn't actually moved anywhere. It was like watching an insensible and interminable soap opera. Overall, the pacing was poor, and the entire series felt like a self-indulgent exercise for the author to explore the world of his own creation as opposed writing with any sort of reader other than himself in mind. It could have been finished in 7 books with no loss. God knows why I even bothered persevering and giving this series chance after chance. I gave up after Book 10, by which point I had wasted more than a decade of my life on this mess. I wish I could see why this series has a 4.6 rating; I keep hoping to find a reason or way to finish the series, but nothing in fellow readers' reviews has sparked any hope. If the Shannara series is a third-rate LOTR, then WoT is a third-rate Shannara. Such a gifted writer with talent and passion with words and imagination. It was a long, enduring journey to read through all 14 books, but, oh, so worth it. Worth re-reading from time to time. This series has inspired me without end, and so beautifully written. It will be impossible to forget such a tale.